Menu 33 – GO TERPS! Let’s start with a congrats to 5th seeded MARYLAND in the NCAA Tournament!! Actually I’m conflicted here since I didn’t go to Maryland (Georgetown! Oh but we didn’t make the tournament..) and I have family history in Kansas…but I’m partial to Maryland food, so here we go with a Maryland themed menu. Game one against the South Dakota State Jackrabbits (jackrabbits? The ignominy) is Friday – you have tons of time to plan this…read on! One of the best memories I have of growing up is going to our church Annual Crab Cake Dinner. Crab cakes, green beans and something for dessert. I barely remember dessert because it was really all about the crab. From 1976 – 1999 my family lived in Hyattsville, Maryland. When we moved there from upstate New York I remember thinking how nice it would be to live in a place called “Mary – Land” and that I would probably be friends with Jimmy Carter’s daughter, being a neighbor to DC, you know. Maryland is a lovely place to grow up. The state itself is remarkable – country, city, beaches, mountains. A little Northern and a little Southern…the best of both. This week host a Maryland Pot Luck (Marylanders like to share, so make your friends contribute to making this menu) and celebrate the state that is the birthplace of “The Star Spangled Banner”, where jousting is the official state sport, where school is closed if they PREDICT snow and where pizza is cut in squares! You’re expecting a bushel of crabs? That would be awesome but obvious. 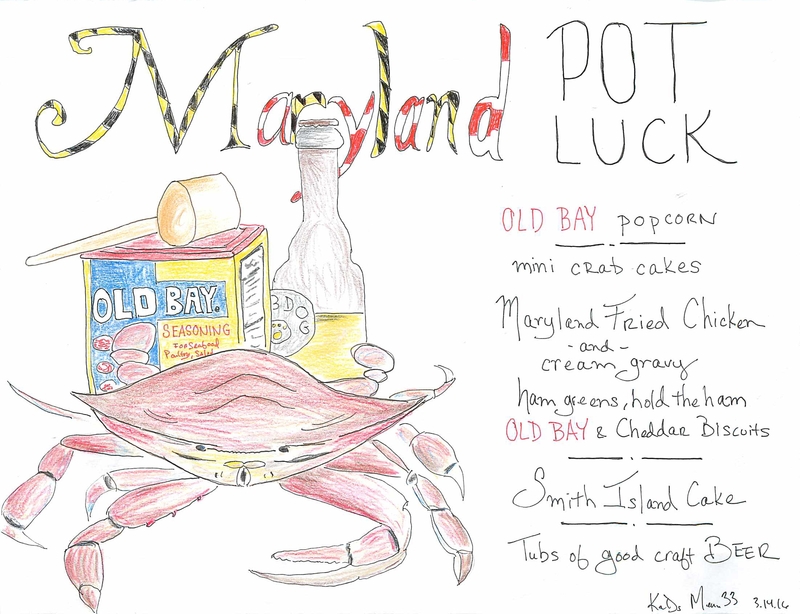 We’re getting a little more creative here…do you know Maryland is also known for its fried chicken? Best food EVER. Maryland fried chicken is distinguished from other Southern fried chicken as rather than cooking the chicken in several inches of oil or shortening, the chicken is pan-fried in a heavy cast-iron skillet and covered after the initial browning so that the chicken steams as well as fries. Let’s give this a try. Don’t worry – of course we will start with crab and there will be a LOT of Old Bay. As people arrive, have a few bowls of Old Bay seasoned popcorn around and serve a local beer. There are a number of good craft beers in Maryland, but if you aren’t there, have one from your own state. Then set out big trays of bite sized crab cakes (mostly crab, very little cake). Next, the fried chicken with gravy – and (hold on to your seats) Old Bay & Cheddar biscuits (OMG). We aren’t skimping on seasoning here (Maryland itself by the way has four true seasons). If you want to serve some greens right now like kale, cabbage and spices do so – you would be nodding to yet another Maryland specialty of stuffed ham (which seemed a little over the top even to me, but the greens would be nice here). And last but not least, have someone make Maryland’s Official State Cake (another thing that makes Maryland AMAZING – we have our own CAKE). Read about it HERE and then lick your fingers. You’re full of carbs, crab and Maryland goodness. Flop down on the couch in time for Terps v. the Jackrabbits, this Friday at 4:30PM EST, Hon! Fried Chicken – Maryland’s Eastern Shore home to Perdue. I probably won’t be buying Perdue but don’t let me discourage you. Posted on March 14, 2016 by Kylie SachsPosted in parties, potluckTagged blue crabs, maryland, old bay, potluck, terps!.